One of the frustrating things about touring another country, one quite foreign to one’s home base, is not being able to quickly identify the birds you see. I get that even here in Australia, especially when I visit family in Sydney, two day’s drive from home. At home it is a different matter as I can generally ID a species merely by call. It’s even fun sleeping in, making a list of species in the dawn chorus. On our two week tour of Morocco I was primarily a tourist, taking in all the sights, sounds, smells and cultural differences. Birding was low on my priorities, and photos – like those shown today – were taken on the run and often at extreme zoom. 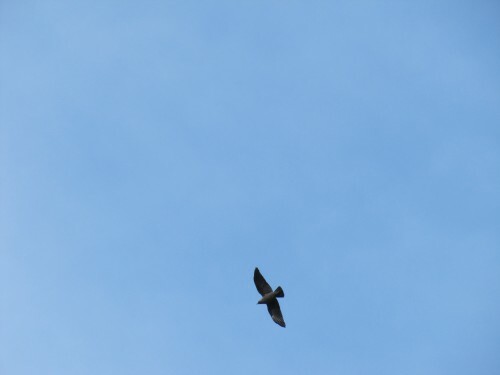 I have really puzzled over the bird shown in today’s photos, which I took in Meknes. The best I can say is that I think it might be a Western Jackdaw. The general appearance seems to fit this species, as does the habitat – a large square with many people with several dozen of these birds present. If any of my readers can throw a more positive light on it, please let me know. 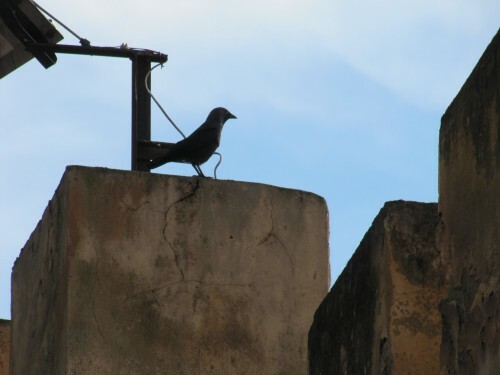 UPDATE: one of my readers has confirmed that the bird is indeed a Western Jackdaw. Thank you. The bird is indeed a Western Jackdaw (Corvus monedula), if you look closely at the picture above, you will see that the nape is slightly greyer than the forehead and the back (when the light is perfect, the nape grey is obvious). have spelling errors every other sentence. Thank you for taking the time to write something that doesn’t look like a 6th grader put together. I apologize, just had to vent.